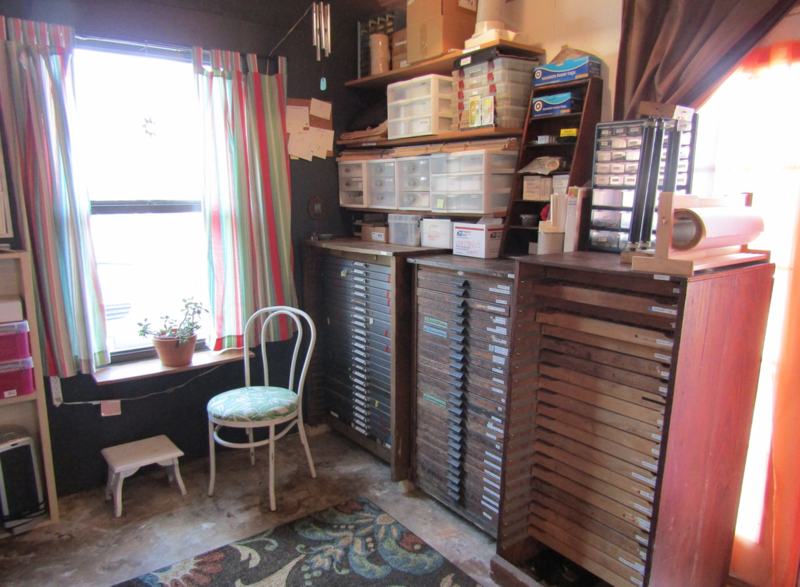 I've been planning this for a while and FINALLY got the papers tidied enough to welcome you, virtually, into my studio. 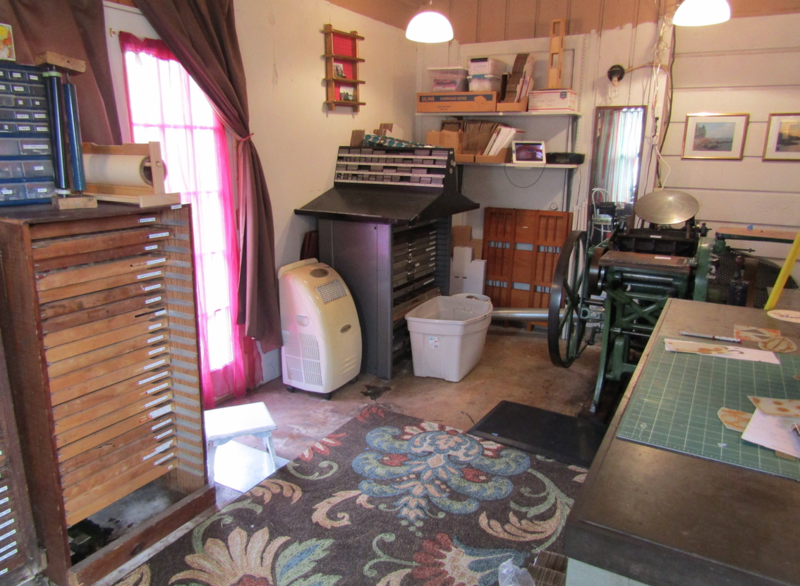 The studio is in the converted carport of our house, and previous owners seemed to have used it as storage. One chainsawed-out section of a wall and one french door installation later, and inviting moved in. There are been slight improvements since then, of course, like colorful curtains (and thermals to help with the summer heat), some white paint, some near-black paint, a place to sit, a rug (it really ties the room together) and a little feng shui thanks to my mom. You've got some type cabinets on the left, a HEAVY composing stone on the right, and Vera the press in the back right corner. The studio isn't air conditioned so near the french doors is my wee cooling unit which gets wheeled over to the window during the hot months, where it makes a difference until about noon, and then I have to call it a day. One day I'll get the place properly insulated and have a small unit installed, where that little pink shelf is. This is what you see when standing near the black composing stand. The front door, little seating area for tea, taking phone calls while I'm working, and instagramming. (Sometimes Hobo Cat #3 sits there- he'll come in and watch me work). The composing stone, with all it's wonderful wooden tools, is from the San Jacinto College, which is where I took some art classes as a kid- small world! On it are three boxes of printing plates. There's also a little space heater, and some display items for craft shows by the window. And this is standing next to Vera. You can see more of the type cabinets and paper storage drawers. 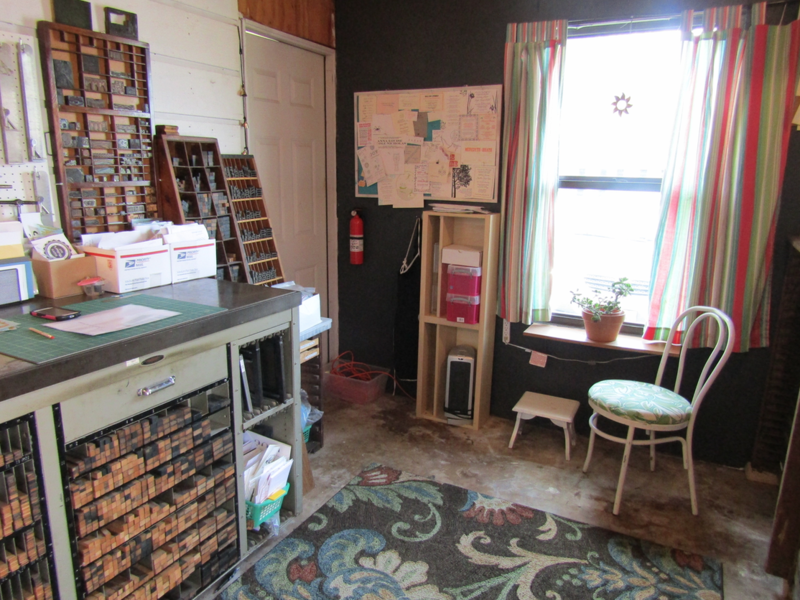 I'm always envious of printers who have their press next to a window for the natural light, but that corner has a tendency to flood on really heavy rain days (not a lot, but two of those cabinets are up on bricks for a reason), plus, the outlets are on the opposite wall. Here's Vera, our lovely, green, small, beast of a press. She's a Chandler & Price New Style platen press, 8x12. There are some folding tables near her for any shows that I do, or if I need extra work space in the house or office, our inks, the mirror that previous owners up had which is convenient for looking out the window without having to stop printing, my little A/V spot for watching netflix or listening to pandora, and cleaning/maintenance supplies and tools. So that is my little studio. It smells of metal, wood, ink and oil (trust me, it's wonderful), the flooring is cool, ceilings are high (and therefor not painted yet), and it is a happy little corner where I am thrilled to spend time printing lovelies for you. It's not much, but I love it. What do you think? 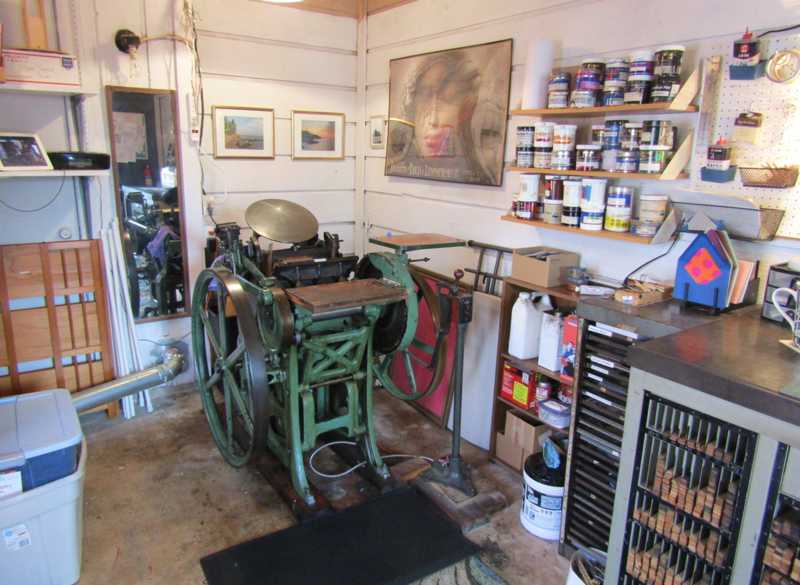 Is it what you imagined my small printing studio to look like?